Built in September 1944 at the Lima Locomotive Works in Lima, OH, this coal burning steam locomotive was designated part of the S-2 class. No. 765 was delivered to the New York, Chicago, and St. Louis Railroad (popularly known as the Nickel Plate Road) and powered passenger and freight trains until its retirement in June 1958. It was eventually donated to the city of Fort Wayne in 1963 and chosen to be displayed in Lawton Park on the city’s south side. In 1974, No. 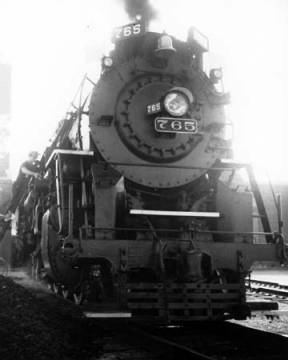 765 was retrieved from Lawton Park by the Fort Wayne Railroad Historical Society and returned to operating trim. From 1980 to 1993, the locomotive campaigned throughout the eastern United States pulling passenger excursion trains on many of the major railroads. These immensely popular trains introduced many to the excitement and rich history of American steam railroading. Though still based out of the Fort Wayne Railroad Historical Society, it is currently in the midst of a second excursion campaign. It was placed on the National Register in 1996. Indiana Division of Historic Preservation and Archaeology, “New York, Chicago, & St. Louis Railroad Steam Locomotive No. 765,” Discover Indiana, accessed April 25, 2019, https://publichistory.iupui.edu/items/show/271. Published on Jan 31, 2018. Last updated on Apr 2, 2019.